Ms. Qian（Sophia) Xiao, currently serves as the Head of Forfaiting Team at Global Trade Services Department of Bank of China Head Office. Ms. Xiao is an expert specialized in trade finance services from her 23 years’ professional career. She has been in charge of foreign exchange management, product development, marketing of trade finance business for Bank of China globally, and is familiar with all types of international settlement, guarantee and structured trade finance products. Before the current position, Ms. Xiao had served as the Head of Factoring for more than four years since 2009 and she was also the Head of Forfaiting and Guarantee Division at Trade Services Department of Bank of China H.O. from 1999 to 2009. She began her career at International Settlement Management Division of International Department of Bank of China H.O.in 1994. She used to service as the guarantee, forfaiting and factoring panels of experts for ICC (International Chamber of Commerce) China, non-executive director of IFA (International Forfaiting Association, now ITFA), Chairperson of the Nearc (North and East Asia Region Committee) of IFA. 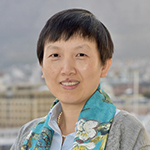 Ms. Xiao holds a BA degree in Finance from the Capital University of Economics and Business and a Juris Master degree from the Law School of Peaking University.